In a time when a myriad of information is available for the building and flooring industries, it’s always interesting (and a little frustrating) when some common misconceptions about moisture testing concrete will cause building professionals to assume they are not at risk for moisture-related problems with their flooring installations. MYTH #1: If the concrete surface is dry, the slab is dry. For most slabs that dry from one side, the surface is the only escape route for the moisture in a drying concrete slab. As moisture evaporates away from the surface, more moisture can move up through the slab. Therefore, it seems reasonable that if the surface is dry, it could be taken as a sign that there is no more excess moisture in the concrete. However, it has been demonstrated repeatedly that the surface of the slab cannot serve as an accurate indicator of overall moisture levels. Because there are so many variables that can impact the drying rate of a concrete slab–air movement, ambient temperature and relative humidity, troweling techniques, and more–conditions at the surface in no way reflect the presence of moisture within the slab, and leave any test method that only tests the surface to be highly suspect. The only way to accurately determine when a slab is “dry” is through relative humidity (RH) testing that places a sensor inside the slab away from the surface. RH testing at the correct depth gives a clear picture of the final concrete moisture measurement if the slab were to be sealed at that point in time. MYTH #2: All floor products have similar moisture tolerances. At one time, flooring adhesives or some flooring materials were more consistent in their moisture tolerances because most products had a petroleum-derived base in their compositions. Although moisture-related flooring problems have always plagued the industry, as formulations began to change for specific applications it became increasingly important to be sure that concrete slabs under the flooring installations were dry in order to prevent moisture-related problems down the road. With the recent advent of the industry’s focus on lowering VOCs (volatile organic compounds) in building products, different adhesives and flooring products on the market today can vary greatly in their tolerances to extended elevated moisture conditions. For the best results, accurate RH testing should always be performed in order to a) determine the current slab moisture condition, and b) be sure the product specified is compatible with the slab moisture levels, or c) choose an alternate product that meets the current moisture conditions of the slab. For a quick link to a multitude of manufacturers that specify RH tolerances for their products, visit www.rhspec.com. MYTH #3: The concrete is “old” so it has to be dry. Even when a concrete slab has been in service for years, it’s still possible that moisture levels within the slab are high. Unfortunately, it’s not unusual for an old flooring system to be removed, only to have the newly-installed flooring start to exhibit signs of moisture-related problems. Part of the reality with older concrete and flooring systems is that the products used in decades past were inherently more moisture-resistant than many of the products on the market today. The move to lower environmental impact products (like products with lower VOCs) has resulted in the need for more awareness for moisture tolerances in flooring adhesives, sealants, and flooring products. Hence, an older floor that has never shown signs of moisture problems may still be too high for the RH sensitivities of the new product. It’s also possible, of course, that an older concrete slab can be facing moisture intrusion from an unidentified source (a compromised vapor barrier, an appliance or plumbing leak) that has raised the slab’s moisture content but not yet reached critical levels for the older flooring. The best insurance for older concrete slabs is still to do RH testing before installing a new flooring system. The unique design of the Rapid RH® seals a sensor in each test hole for immediate test results. It’s fast, accurate and affordable testing that saves on your bottom line by allowing ASTM-compliant testing at the touch of the Easy Reader. MYTH #4: The slab is not on grade so I don’t need to do moisture testing. All concrete is affected by ambient conditions, and all concrete is susceptible to moisture-related complications if not adequately tested before the next stages of construction begin. Slabs on grade (or on pan decking) have only one surface that moisture can use to exit the slab. Slabs not on grade have two surfaces from which moisture can move out of the slab. This also means that concrete slabs not on grade have two surfaces that can absorb moisture from a humid environment or external moisture source. The need to do accurate moisture testing has little to do with the format of the pour. The correct test method, however, has everything to do with the on-grade or not-on-grade status of the slab. For RH testing, studies have shown that for accurately testing final moisture conditions within a slab, 40% is the correct test hole depth for slabs poured on grade or in pan decking (or with one surface from which the moisture will evacuate the slab). 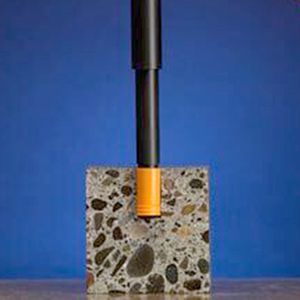 For slabs with two surfaces exposed to ambient conditions, the correct test hole depth is 20% of the slab’s thickness. RH testing for concrete is the only way to ensure against moisture-related problems over time. Only testing done at the appropriate depth will provide accurate and actionable results. MYTH #5: Surface testing concrete gives a final accurate moisture level. As was discussed above, any test method that relies on surface conditions is at risk of producing a false reading. The Calcium Chloride Test (or MVER) seals a desiccant material under an impermeable cover and then calculates the MVER rate by weighing the material after a set amount of time. The theory behind this test method is that the desiccant will absorb moisture emitting from the slab. That weight gain will express a ratio of the remaining moisture in the slab. Unfortunately, there is no scientific basis to the test and it has been specifically disallowed for some concrete types. The Hood Method places a probe or sensor on the slab surface and again seals it under a moisture-resistant, insulated hood in an effort to mimic the conditions that flooring would be exposed to if it were installed. Moisture meters operate by sending an electrical signal into the concrete and measuring its resistance as an indicator of the moisture level in the slab. While they can be a useful survey tool, they typically operate at about ¾” depth and can be susceptible to other elements within the slab: rebar, certain aggregates and more. Ultimately, understanding the distribution of moisture in a drying slab makes it apparent that surface-based test methods are unreliable at best. Moisture levels in a drying concrete slab tend to be higher at the bottom of the slab but will equilibrate (disperse evenly) through the slab once it has been sealed by a floor covering or other technique. Any test method that doesn’t measure below the surface into the slab cannot give an overall picture of what moisture levels will become once the flooring is installed. When planning to install any type of flooring or finishing product over a concrete floor, only accurate Relative Humidity testing, like with the Rapid RH®, can provide accurate, affordable and industry-compliant concrete moisture testing. Don’t let some of these common “myths” about moisture testing become a costly mistake for you. MYTH #1: Drying time can be estimated accurately. An industry rule-of-thumb for drying concrete is to allow one month of drying time for each inch of slab depth. Unfortunately, an understanding of the process of moisture movement in a drying slab can very quickly make it clear why any attempt to estimate a slab’s drying time can be a gamble. In order for concrete to dry, a large percentage of the excess moisture in the slab must be able to reach the surface and evaporate. Moisture within a concrete slab follows a number of small pathways, or capillaries, that form as it combines with the initial mix elements–cement, aggregate, and any other admixtures. If these pathways are blocked for any reason, or if they are not dispersed well through the slab, the amount of time it takes for the moisture to move out of the slab will be slowed significantly. An overzealous troweling job or sometimes even a curing compound applied to the surface will prevent the moisture from escaping the slab, and that’s only the direct influence on the drying process. 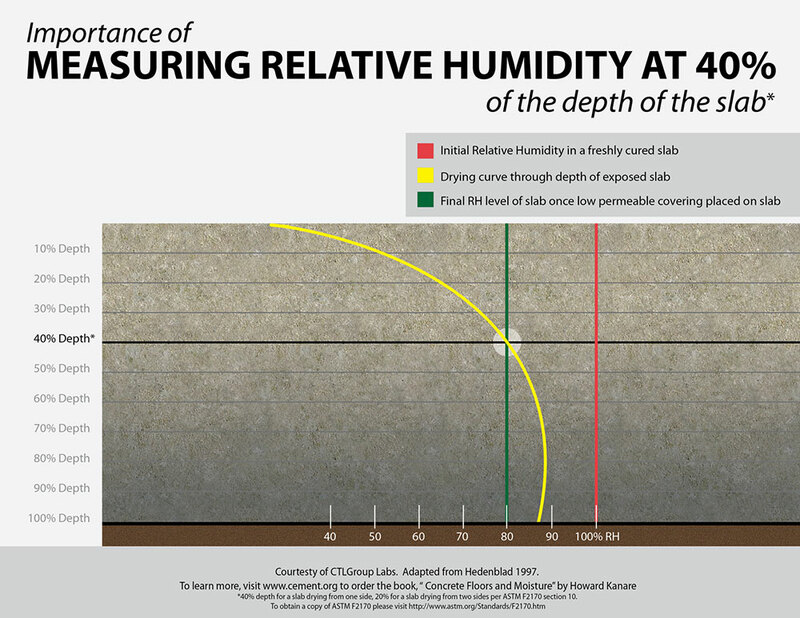 Ambient conditions also have a very significant impact on concrete drying times, so any change in relative humidity, air movement, temperature (as it relates to ambient relative humidity) or HVAC impact will ultimately affect the final drying schedule. Only accurate RH testing can monitor the actual moisture conditions inside a concrete slab for dependable results. MYTH #2: All RH tests are the same. All RH test methods are the same in that they are based on research that demonstrates how internal concrete moisture measurement (measurement is taken below the slab surface) is proven to be more accurate when testing concrete moisture levels. However, the way each RH testing product is designed can have significant impacts on both accuracy and performance. Most RH test methods use removable sensors that must be inserted into the test hole and then allowed time to re-equilibrate for each and every reading. (Calibrations for each sensor must also be checked no more than thirty days before each use). This type of sensor makes RH testing a time-consuming and tedious process that involves more waiting than testing. It also leads to “leapfrogging”: moving the sensors from one hole to the next, often with insufficient time allowed to let them equilibrate to each new test hole. Only the Rapid RH® 4.0 EX makes use of technological advancements that help ensure both accurate testing and industry compliance. From the Smart Sensors that install directly into the slab for one-time equilibration to the Touch-n-Sense™ powered Easy Reader, the Rapid RH®’s technological innovations ensure proven accuracy, dependability, and affordability. Calibration is also always certified with each Smart Sensor coming with a NIST-traceable certificate of calibration. MYTH #3: Test hole depth is approximate. The target of RH testing is to be able to determine the moisture levels of a concrete slab once the floor covering is applied. Why? Because if the moisture level is too high, it puts the entire floor system at risk, and billions of dollars are spent in repairing moisture-related flooring failures each year. 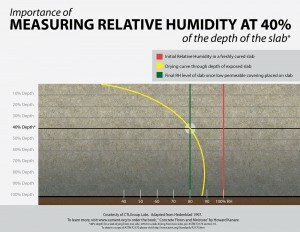 It’s important to understand how moisture distributes in a drying concrete slab. Moisture levels inside the slab tend to be higher at the bottom of a slab that is unsealed but will equilibrate (disperse evenly) through the slab once it has been sealed by a floor covering or other technique. Until the slab is sealed, though, the depth of the test hole will definitely impact the accuracy of the RH reading. That fact is why standards like ASTM F2170 are in place–to ensure that testing happens at the correct depth. For slabs drying from one side, like slabs poured on grade or pan decking, 40% has been proven to be the correct depth for RH in situ test holes. If a slab is drying from two sides, 20% of the slab depth is necessary for accurate RH test results. Only RH test holes drilled to the correct depth will provide results that reflect true moisture conditions in the slab and let the flooring installer proceed with accurate information about the moisture conditions that will be in contact with the installed flooring once the job is complete. MYTH #4: Concrete additives don’t impact drying time. The irony of this concrete myth is that some concrete admixtures are MEANT to impact drying time. Superplasticizers, for example, like lignosulfonate or polymer compounds, are designed to reduce moisture content in concrete slabs so (in theory, at least) drying times can be reduced. Other additives cover a range of intended uses from reducing shrinkage or damp-proofing to extending workability to adding pigments for color applications. Each class of admixture chemically enhances or changes the properties of the concrete batch, and can subsequently impact the actual drying time of the slab. Different admixtures can also impact certain types of moisture test methods. Only RH testing provides legitimate moisture testing results for any drying concrete slab. MYTH #5: Dust on a job site doesn’t impact RH testing. Dust and grit may seem inevitable on a job site involving concrete, but it really can impact the accuracy of RH testing if the test hole is filled with residue from the drilling process. By compromising the air volume around the sensor, excess dust or concrete residue limits the ability of the sensor to provide accurate readings. In order to assist in drilling the cleanest test hole possible, each Rapid RH® Flooring Package comes with a wire brush to help dislodge any loose particles in the test hole that might remain after drilling, as well as a vacuum attachment that allows you to clean right to the bottom of the hole. Between readings, the provided orange flush-mount protective cap not only helps identify each hole but also prevents site contaminants from getting into the test hole as well. When planning to install any type of flooring or finishing product over a concrete floor, only RH testing like the Rapid RH® 4.0 EX can provide accurate, affordable and industry-compliant concrete moisture testing. Don’t let myths about concrete moisture testing become costly mistakes for you. I installed a vinyl tile on a concrete slab in February.The installation was fine until the following summer when the flooring started to lift.The installation site was in Northern Ontario Canada where the outside temperature is normally way below 0 degrees Celsius ,from late October to mid March.Average temperatures would be minus 10 for those months. Is there more moisture in a on grade concrete slab in the spring and summer than in the cold winter months?? Thanks for the comment. If there is no vapor barrier below the slab, then moisture IN the slab will fluctuate based on the amount moisture in the soil below the slab. Hope this helps. We live in North Texas and found out that there is no plastic moisture barrier in our concrete slab. House built in 2004, but purchased 2 years ago by us. We put down a vinyl plank with no moisture barrier and it started buckling and bowing after only a fe months. I finally took it all up and found that there was moisture underneath (Not enough to pool), and the smell of mildew. What product should I put down? Moisture barrier under new product to trap any moisture, or something that might allow it to breathe a little such as a ceramic tile? Any ideas would be appreciated. Just make sure the product you are using is rated to 100%RH based on the ASTM F2170 concrete moisture testing method and the warranty doesn’t have exclusions regarding vapor retarders. Raleigh, NC . I am building a restaurant in the ground level of a parking deck. This means PC concrete walls and roof, like a bunker. some people contends that if I don’t spray-foam insulate the place, with the air conditioning and people coming in, at some point it will begin to “rain” inside. I really like the industrial looks of the place, but I am really concerned this may be a real possibility. what do you think? Thank you for the comment. With the addition of heat from the restaurant equipment and the in and out traffic, you may have an issue. The only way I know to be sure is by finding an engineer that can input the different variables into a computer model, which includes exterior vs interior conditions, concrete thickness, etc. I hope this helps. I am stumped !! I am a concrete restoration contractor in Florida. I have a project that has elevated walkways. ( 2 ways for vapor to exit ) The assembly is as follows. The topping cementitious coating is the top layer. Underneath is a cementitious waterproofing membrane. Under that is a cementitious flash patching material. The flash patching or third tier down is crumbling apart after 2 years of being installed. As you can guess, the 3 tiers are now coming up. Before I read your facts on moisture meters I did check the elevated slab. High readings on the prog meter I used. What I find interesting is the underside of the catwalk has been painted……over and over again for years. The paint is a breathable product but after a preliminary ancient test of taping cellophane to the ceiling I get zero moisture exiting 1 of the 2 exit points. Using the same exercise on top, moisture evident via water droplets. My Theron is the water vapo is taking the path of least resistance and exiting entirely at the catwalk surface breaking down the flash patch material. My next step is to remove an area of paint from the stucco and also in another area remove paint and stucco from the underside of the catwalk. My expectations is I will now see moisture. Would that concur with my aformentioned theory that the high amount of water vapor exiting the top portion of the catwalk is chemically not conducive to the material and breaking it down ? I can use some input if you have time. Thanks for the comment. Sounds like you have an interesting puzzle you are trying to put together. Your theory may be correct, but I give other things to think about. 1) The plastic sheet test really isn’t a good test, especially in this situation. Many times, the presence of moisture under a plastic sheet can be caused by condensation related to dew point considerations. Given that surface temperatures of the concrete, even in an open environment, could be different because of direct vs indirect contact to sunlight and varying ambient conditions, the dew point threshold would vary between surfaces, potentially causing the “moisture” to appear on the plastic. This being said though, this would have little to do with the moisture coming out of the concrete. 2) You talk about moisture moving out of the bottom, but what about moisture moving into the bottom due to high relative humidity in the air and higher temperature on the top side of the slab? Although you theoretically have two directions for moisture to move, having varying conditions, both temperature and relative humidity, exposed to both surfaces, may affect the direction of moisture travel. Concrete being hygroscopic, it can expel and absorb moisture depending on the environment. Unfortunately, I don’t have a solution, but I hope this information helps you in finding a solution. Good luck! Hey – can you help? My builder has just put down a sand/cement concrete screed floor at 67mm thick (under floor heating beneath) and wants to lay engineered wood flooring on top of it in 2 weeks. Everything i am reading suggests waiting maybe 2 months! What would be your advice and the best cost effective gadget to measure this? Would it help in 4 weeks putting down a DPM – paint liquid version all over the floor? Thanks for the question. If it was my project, I would be asking the installer how they were going to determine the screed was sufficiently dry for flooring installation in that two week period? I would also get the installation documents for the engineered flooring and the adhesive to be used. In these documents, there will be specific requirements for moisture testing and thresholds of acceptance. If the method the builder is prescribing to moisture test and the manufactures methods aren’t the same, then you are better informed during your conversations with the builder. DPM’s are very effective, but they are not all created equal, so again, get the installation documents for products you may use and compare what their maximum moisture tolerance is and what their warranties include and exclude. Good luck. A fascinating read indeed. I have a query. Can you please answer this question? If a dry concrete is placed in an environment with high relative humidity, can the humidity inside the concrete structure be higher than the surrounding environment because of the moisture absorption by concrete structure? Say, the relative humidity of surrounding is 90%, can the relative humidity inside the concrete be more than that? Thanks for the comment/question. You will usually find the two environments, concrete and the ambient conditions will attempt to reach equilibrium with each other. Depending on the variation in RH% between the two, the process will start fast and then slow as they get closer to each other. Unless there is another source of moisture, say the soil, then the ability of a “dry” concrete to be higher RH% than a consistent 90% RH ambient environment is negated. house and do waterproofing also. I’m at a loss, I don’t know what to do or who to call. I need to put down knew flooring but I need to find the root of the problem first. I keep doing research but that’s only confusing me more. The parquet was glued down on the bare slab and now I can pull it up with my bare hands. I don’t want parquet again nor do I want carpet. I was thinking about vinyl that clicks together but I’m also concerned about the same issue. Thanks for the questions. You really have too many variables you have thrown out here and we would go back and forth with various questions and answers for me to even begin to formulate a reasonable response. One thing you haven’t told me is what the actual moisture levels are in the slab. This is information you need to determine in order to start formulating a solution. Beyond that, it would be more efficient for us to have a phone discussion. Please feel free to contact me at 800-634-9961. My house is on a concrete slab and I had a leak in the bathroom wall that sent water to the adjoining room. Didn’t know for a week until discovered the carpet wet in the room. Pulled up the padding and rug to let the concrete dry. After two weeks my moisture meter still show 100% in the area that was wet. Other areas of the room not effected by the leak show 30 to 50%. How long will it take to dry that I can put carpet back? How do I accelerate the drying? Thanks for any advice you can provide. Thanks for the question. Its hard to say how long it will take, but air movement across the surface area of the affected area might help expedite the process. Also, depending on the size of the area, it may help to use some type of dehumidifier. Good luck. I have pulled up carpet due to plumbing leak in my 1992-built basic slab Houston area track home. While letting the concrete dry, I’m debating whether to paint the floor instead of laying LVT planks. Wondering if the slab needs to “breathe” and if painting latex Porch Floor paint would allow it to breathe? Thanks for the question. MOST paint is quite breathable. In your case though, it is also latex and may be more susceptible to moisture, especially is the surface of the concrete is wet. The slab may need to “breathe”, but we can’t really answer that question because we don’t really know if or how wet it is. You would typically perform some method of moisture testing to quantify if there is a problem. Good luck. Two years ago, my 40 year old house on a concrete slab flooded (6 inches of water for a few hours). Following a 6 month drying out period, new wood flooring was installed where carpet once existed. Now, in selected areas, moisture from the slab has stained the wood and required the removal of a very minor portion of the flooring. RH testing of the slab in those areas is very high despite no cracks or deteriation of the slab. 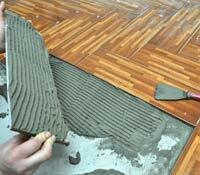 What is your recommended remediation before the wood flooring is replaced? Thanks for the question. Trying to selectively mitigate areas like this may be difficult and tricky. I would work with a certified wood flooring installer in your area to remedy these issue. You can find one by looking at http://www.nwfa.org. Good luck. Like your site. I have a wine cellar/ that I place in my home at the start of building. It has all concrete walls 10 feet down, then we build a wood ceiling with 2 x 10 and covered it with plywood and poured the main foundation over it. The basement leaks, we have tried everything. The entrance down is with a ladder through a 2 foot by 4 foot opening. There is never more than 4 inches of water, pressure in,pressure out. Can we just cap over the 2 x 4 entrance with concrete?? Or will the moisture forever come up through the concrete and be an issue if we sell one day. The basement is over the utility room, not a living space. Thanks for the question. I would have a structural or soils engineer come out and evaluate the situation. I would imagine you will still need to potentially do some waterproofing on the wall, in general, after a solution has been found. moisture in the winter months. I think the house is so tightly sealed that just a little difference in the weather that condensation starts to show on my windows. I was thinking that the extra moisture is coming from the basement concrete floor.. The house was built in 2005 and is on a hill. My sump pump crock is always dry and when we get a heavy rain storm the pump seldom runs. My question is would the basement floor and walls be a reason for my high level of humidity in my home. i was trying to find a way to measure the moisture in the floor. My husband and I purchased a condo in Largo, FL. We had an inspector look at everything, there were 2 minor leaks, one in the shower and one in the laundry room, no big deal, the plumber took care of that. so we went to proceed with the remodel which included new flooring. We took up all the tile and the cement beneath it was wet. So we ran the AC on high and it dried up a bit but the ac went out for a week until we could get it repaired and it was soaked again, you can see where the old grout lines are and it is the ENTIRE floor, not just near plumbing. Of course now we have mold issues being in Florida it grew fast, so we have ripped out the drywall, etc. etc. Not to mention that when we ripped up the tile we discovered all of the lower cabinets were moldy and wet as well, so all of this was going on underneath the tile and nobody knew it (or said it anyway before we purchased). The HOA insists that its not there problem if the cause of the problem is not in the walls or under the cement. I have searched and searched for a company that can test the cement to tell us what the issue is, meaning is it a failed vapor barrier, one guy suggested too much ash in the concrete, at any rate it is clearly coming from the ground. That being said. Are your products user friendly for a non-professional to use and affordable? Also, do they have the potential to tell us if the moisture barrier has failed or if say water is coming up from the ground due to the small pond on site or a large leak from the water company. I know it won’t magically say it, but I’m assuming there is a scale and that you have some kind of guide that would point us in the right direction. Then if we did determine what the issue is, would your company have information on how to best handle it? We really are at our witt’s end and no one knows what to do. the complex was built in the 60’s and obviously it is a first floor unit. The HOA is no help. Reports from neighbors, right next to us she said the flooring people put down a sealer that was pink then turned red (or vice versa, she couldn’t remember) and on the other side (renters) noted that they do feel squishy floor every now and again. Please say you can point us in the right direction, we would be ever so grateful. Thanks for the questions. I am narrowing it down to the one main question and that is who. In my opinion, I would want to verify there is a vapor retarder first. Probably your best bet would be a geotechnical engineer to do a core sample of the concrete slab to definitively determine the answer to this question. You might want to start here https://www.terracon.com/offices/tampa-nodarse/ Good luck. Thanks for your article.. It was very helpful. If I have to do epoxy floor coating on concrete structures, how much should be the ideal moisture content (%wise) or RH to start the work? 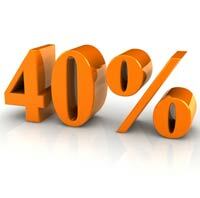 Means what is the acceptable value of RH for starting the epoxy floor coating. Thanks for the question. It depends on the specific coating, but many epoxy coatings I have seen are 75-80%RH. Again, make sure you contact the specific manufacturer to verify. We installed carpet tiles on old concrete floor. We used a sealer glue to install the carpet, but in one spot the water comes back thru the concrete. Can you tell why this keeps happening. Thanks for the comment. Based on the very limited information you have provided I would question whether there is an intact vapor retarder under the slab and the center happens to be the path of least resistance for the moisture to escape from the soil. The one way to make this determination is to do a core sample in that center area. I intend on laying rolls of moisture barrier underlayment that will be taped together, then installing a better vinyl plank product. I am assuming that water may do the same thing under the vapor barrier. I am thinking that I might want to apply a concrete sealer to trap water below the surface before the underlayment. Do I need to worry about this? Thanks for the question. This microbial growth issue is one of those issues that, in my opinion, will start to become more prevalent with the increased usage of “loose lay”, products. I believe you should be thinking about this and try to be proactive. Good luck. Hi Jason wanted to get your opinion on a situation we have experienced, our house is a couple years old built by hey high end commercial Builder. We live in North Florida and had new flooring installed in January during weather in the 70s. The flooring was manufactured to order it is engineered hardwood. The flooring was installed within a week to two weeks of delivery from manufacturer. prior to installation we had all ceramic tile floors that was removed by the ride on machine method. A dritac moisture barrier glue was also used in the installation process. After a few weeks of the installation we started to notice there was some peeking of the ends of the long part of the planks. They are not really visible in certain lighting although when there is a glare coming from some of the windows and sliders you can see them throughout the floor. Also would like to add that the dining room and office had a cheaper hand-scraped hardwood that was installed when the house was built we did not notice any problems with this although it has a dimmer lighting and also being hand-scraped we were not able to detect if there were any issues with that flooring. Do you have any ideas why this would be happening and could this be an issue with the manufacturing process. Also will a tramex cmex surface moisture meter give us any clues. Thanks for the question. This could be any number of issues, probably all related to moisture in some way. How was the wood acclimated? What were the moisture readings of the wood prior to the install? Based on the installed environment, what was the target moisture % of the wood? What were the moisture readings of the concrete prior to install? Have any conditions in the house changed after install? I would recommend that you look on this website http://www.nwfa.org and find a certified inspector to come out and evaluate the issue. Good luck.